In the 90s, the four-story Georgian mansion on Mile End Road was rescued by the Spitalfields Trust and became a Grade II listed building. Malplaquet House had even more luck when it fell in to the hands of the best possible buyers imaginable. Enter Tim Knox, British historian, former director of Sir John Soane’s Museum, (another restored London time capsule) and now director of the Fitzwilliam Museum in Cambridge. Together with the renowned landscape gardener Todd Longstaffe-Gowan, these two passionate collectors purchased the 275 year-old East London ruin from the Trust for £250,000. A monumental restoration project began. Over three centuries, the house had been extensively altered up until its last domestic residents were recorded in 1895. In the 1850s, Malplaquet had seen the last of its wealthy tenants and was divided up into smaller lodgings and two shops were built upon the old front garden. Most of the double-fronted property would eventually just end up as storage space for the shops. When Tim and Todd came along in 1998, they had their work cut out for them. Unforgettable, spellbinding, thrilling romantic: these are all words that have been used to describe Malplaquet. Before the house went on sale, a local blogger, “The Gentle Author” visited the mysterious mansion and published his account along with some stellar photographs taken by Philippe Debeerst. "Hovering nervously on the dusty pavement with the traffic roaring around my ears, I looked through the railings into the overgrown garden and beyond to the dark windows enclosing the secrets of this majestic four storey mansion (completed in 1742 by Thomas Andrews). Here I recognised a moment of anticipation comparable to that experienced by Pip, standing at the gate of Satis House before being admitted to meet Miss Havisham. Let me admit, for years I have paused to peek through the railings, but I never had the courage to ring the bell at Malplaquet House before". This weekend my son and I headed to Shining Cliff Woods in search of the Betty Kenny Tree. This tree is reputed to be over two thousand years old and has a very interesting story attached. This ancient yew tree claims to be the origin of the nursery rhyme "Rock a bye baby". The story has been well documented and relates to a family of charcoal burners called Luke & Kate Kenyon from the 1700s. They lived in the woods and used the tree as shelter and brought up their 8 children never once stepping foot in a conventional house. Betty would place the babies in the hollow of a branch and rock them to sleep as she worked making charcoal in the forest. Ironically the path we took is called The Betty Kenny Trail yet it does not lead to the tree nor tell you where it is. I had seen pictures of it before so I know it was in an elevated position in an area of evergreen forest. The area was wet and cold plus the surrounding trees provided no cover so we headed up hill, deeper into the forest away from the river. We eventually reached a dry stone wall that marked the boundary between a patch of moorland and the forest. We decided to follow the wall and then I knew we had reached the right area. The forest to the right of me became incredibly dense and dark, I commented to my son that it was the darkest I had ever seen. With a thick evergreen canopy and the trees so tightly packed, the light from the midday sun could barely penetrate the forest floor. It was Tolkien's Mirkwood made real. The outside temperature was a bracing 2.5 degrees C yet the forest became strangely humid and muggy as we ventured deeper into the darkness. The anechoic blanket of pine and yew felt like a protective shelter from the imminent snow and wind. We finally found the Betty Kenny tree. In the 1930s the tree had been burnt by vandals so the huge space once occupied by the ancient yew was now empty and open to the sky. The light from above the forest floodlit the tree's remains like a UFO tractor beam. In the darkness of the forest it was impossible to miss. 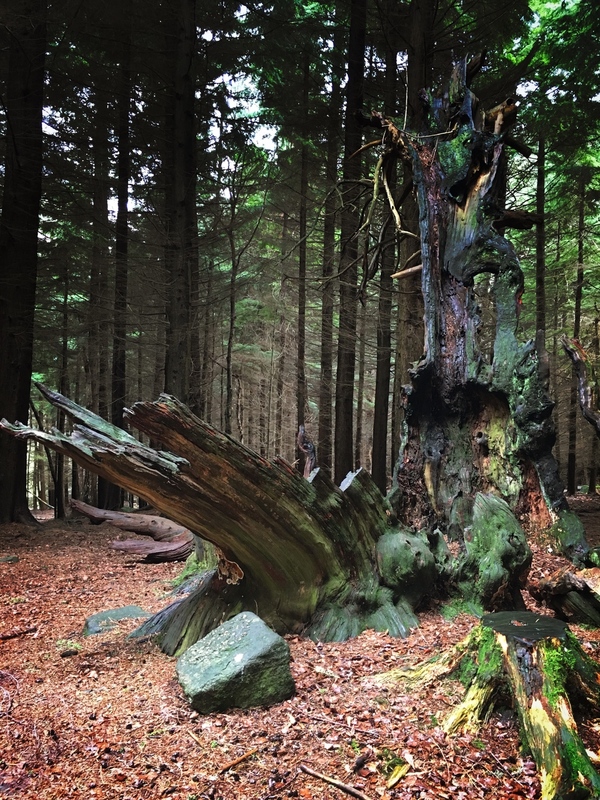 It was hard to imagine that anyone could live for over a century in this forest let alone raise a family of eight children, one of which is still buried beneath the remains of the tree. It's an eerie spot and other worldly when you stop for a moment and try to imagine what the tree has lived through. And it is still alive, despite being used as a home and almost completely destroyed by fire. 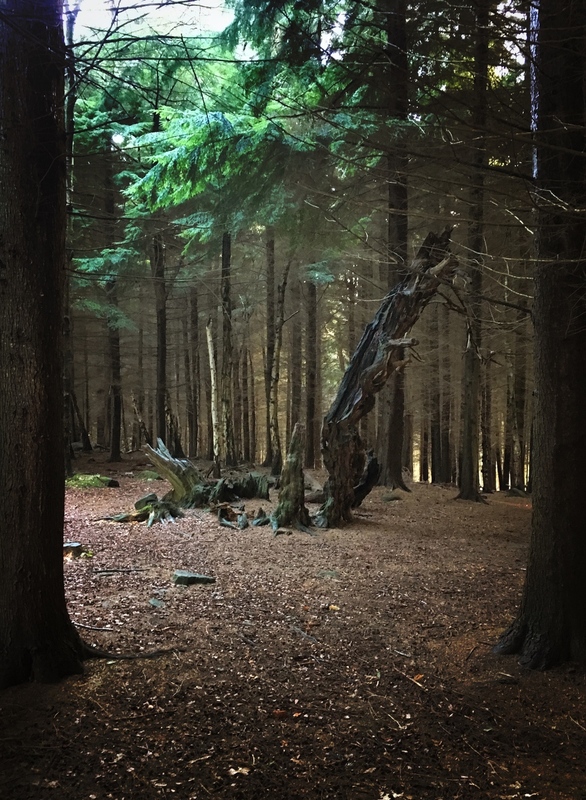 With new shoots protruding from the shattered stump it is as if the sympathetic forest does not grow over and shadow the old tree, yet instead allow the light from above through to keep it alive. And you're not afraid of the dark.